Engr. Ali Nadeem is currently working as Lecturer and engaged in imparting technical knowledge and skills to chemical engineering students at graduate levels in the areas of Separation Processes, Fluid & Particle Mechanics, Chemical Process Safety & Engineering Materials in the prestigious Institute of Chemical Engineering & Technology (ICE&T) at PU. 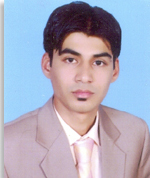 He graduated in Chemical Engineering in 2010 from the Institute of Chemical Engineering, University of the Punjab. His professional career started with Descon Integrated Project. On the basis of his outstanding academic and professional record, he was selected as Research Officer in 2011 at the Institute of Chemical Engineering and Technology, University of the Punjab. After that he was selected as Lecturer at the same Institute. He completed his Master degree in Chemical Engineering from the same institute and got 2nd position in M.Sc Chemical Engineering. His area of research is Biomass-Coal co-combustion and his research work has been published in International journals of high impact factor.